A new study led by Horst Bohner, an OMAFRA soybean specialist, and Chris Gillard and Albert Tenuta at the University of Guelph’s Ridgetown campus will give growers the information they need to make informed spray decisions. The researchers will be looking at several factors, such as disease pressure, response to fungicides by different varieties, environmental factors and the potential for yield increase and economic gain. The study will examine 20 soybean varieties over a span of three years. “The bottom line is will it be profitable to the grower?” says Gillard. For example, just a small percentage of Ontario soybeans are treated with foliar fungicides. But researchers say there could be benefits to applying these fungicides – even in the absence of disease. The fungicide Headline has been used to control crop diseases, and as a product growers can use to increase the plant’s photosynthetic efficiency – that is, the fraction of light converted into chemical energy during photosynthesis. As well, Headline may enhance the plant’s ability to cope with stress, generating an increase in yield. Amylopectin starch and amylose starch are both found in corn. The latter is what’s called a resistant starch that breaks down slowly, making it a good dietary fibre source for both humans and livestock. Dr. Elizabeth Lee from the University of Guelph, Department of Plant Agriculture, is collaborating with Drs. Mike Emes, Ian Tetlow and Terry Graham in the College of Biological Sciences to study starch synthesis, or how enzymes interact to make highly branched molecules that can effect starch production. Amylopectin starch contains these branches, but amylose does not. By screening germplasm, the genetic material in plants, Lee and her research team discovered a previously unnoticed gene mutation in their inbred lines. Two of these mutations put together knocked out one of the branching enzymes and limited starch production. This yielded distorted, shrunken corn kernels. “Because this is a new discovery, we’re looking further into what exactly happens when a protein normally found in starch synthesis is knocked out and what the consequences are to corn,” says Lee. 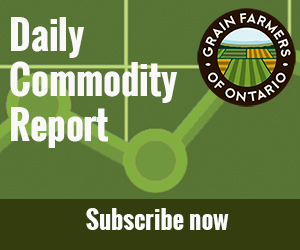 Durum wheat hasn’t enjoyed the best track record in Ontario, mainly because of its susceptibility to devastating diseases such as fusarium head blight, as well as its lack of winter hardiness. However, Dr. Lily Tamburic-Ilincic, a cereal breeding researcher and adjunct plant agriculture professor at the University of Guelph’s Ridgetown Campus, is laying the groundwork for winter wheat varieties to thrive in Ontario. This past year, Tamburic-Ilincic saw two winter wheat varieties developed at Ridgetown – one soft white and one hard red – supported for registration by the Ontario Cereal Crop Committee. This means that the varieties met or exceeded requirements for agronomic performance, quality and resistance to fusarium. She and her research colleagues planted three new winter wheat varieties – winter durum, soft white wheat and hard red wheat – in 10 different locations across Ontario, where their performance will be evaluated next year.